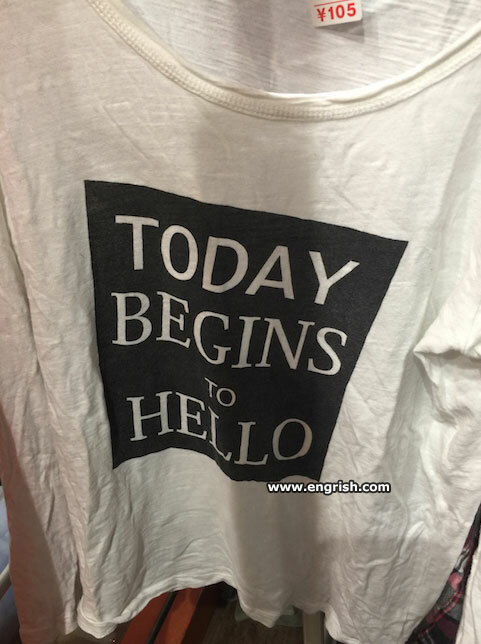 T-shirt maker is already hi, there. It must be time to feed the budgie. September 19th begins to ARR! “Only dull people are brilliant at breakfast”. And it ends with ” ____ __ and the horse you rode in on”. I hate these reformed alcoholics…today begins with a hangover. Well, waddaya know – a talking date! “Hello” has only become a greeting in the past century and a half-before, it was an expression of surprise and the standard greeting was “Hoy, hoy”. @DnT. 0606. ‘Tis the opening date that is most worrisome. …and then it all just goes to hell. @Long Tom 0740. We can be lucky, it could have been “yo” as in Yo yo. More correct I guess. Would be; Hablo un poco de Espano. = I speak a little Spanish. I don’t know Spanish grammar well enough. EDIT : Ok Ok Castellano. For the customary Spanish speakers. EDIT: Espano = Espanol. mil disculpas. Like all days, it must be going. Maybe it will leave some Animal Crackers. As my mother used to say. “Be careful with the enamel crackers, they may break your toothy-pegs. Today begins to hello when yesterday begins to goodbye. Sign on the local pub: FREE BEER TOMORROW. Thirsty patron. “But your sign said, ‘free beer tomorrow’! Lewis Carroll would have told them to jam it. @Marum: In Spanish-speaking countries, the word for “hello” is “hola”, but the telephone response is “alo”.